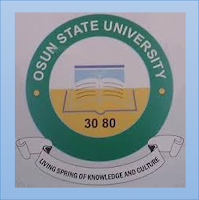 UNIOSUN Post-UTME | Admission Screening, Cut-Off Mark of 2016/17: The University of Osun,UNIOSUN has made available the 2016/2017 post-UTME/admission screening exercise for the 2016/2017 academic session. Candidates who chose the Institution as their first choice of Institution and have gotten the required cut-off mark in the 2016 UTME should apply for admission. The cut-off mark for UNIOSUN post-UTME/admission screening is 180 and above. Candidates must possess a minimum of 5 credits in 5 different subjects (including English Language and Mathematics), at a maximum of two sittings in NECO/WAEC/NABTEB. 1. Candidates should visit the school website at Visit www.uniosun.edu.ng or simply follow this link. 2. Candidates are to pay a sum of N2,500 for the screening online Application is through the Interswitch Web PAY platform using your ATM cards (Master Card, Verve card and Interswitch enabled Cards). The application closing date for UNIOSUN post-UTME/admission screening exercise for the 2016/2017 academic session is on Friday September 2nd, 2016.